There are darn few constants in life, understanding this is why about five million Americans also deem themselves preppers. Yet, there are two things you can definitely count on in any long-term SHTF situation: 1 – calling 911 will not get you the help you desperately need, and 2 – medical preps are the most difficult aspect of any survival plan. To enhance the chances of your family’s survival during a doomsday disaster, you must educate yourself to the highest amount feasible in both advanced first aid and about natural remedies. Secondly, you must not only stockpile all the medical supplies and tools that could save the life of yourself or a loved one, but grow your own natural medicine ingredients to create a sustainable supply of “medications” to get you through not just the long-term disaster, but the societal rebuilding stage, as well. • Start both a backyard and an indoor apothecary. 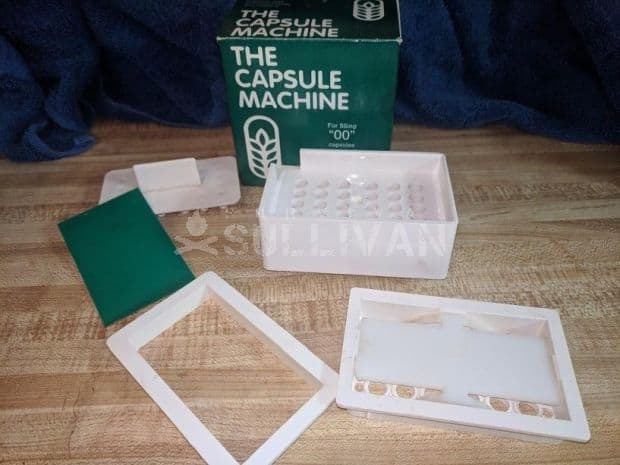 • Invest in a gel capsule maker machine – these are manual devices that are easy to use, inexpensive, and durable. Both the machines and the actual gel caps come in different sizes so you can make medicines for young children, adults, and livestock. When made and stored properly, the gel caps and the ingredients they contain should be shelf stable for at the very least, two years. 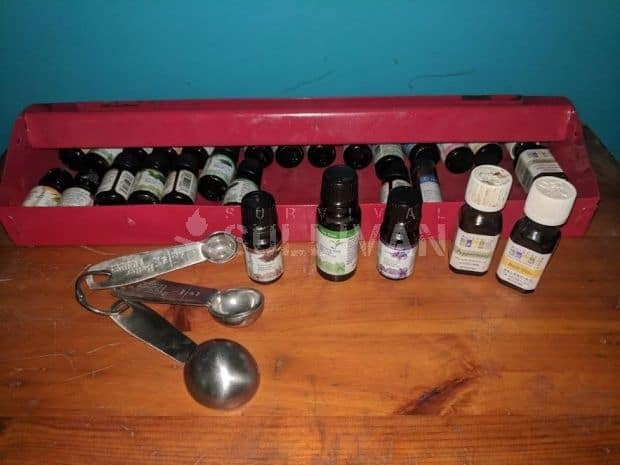 • Stockpile essential oils and learn how to use them both alone and in natural remedy tinctures, teas, poultices, and salves. When stored properly, essential oils should have a shelf life of at least two years, but I have personally used some oils stored in a cool dry place five years after purchase. They were created in the 1950s and updated in the decades since. 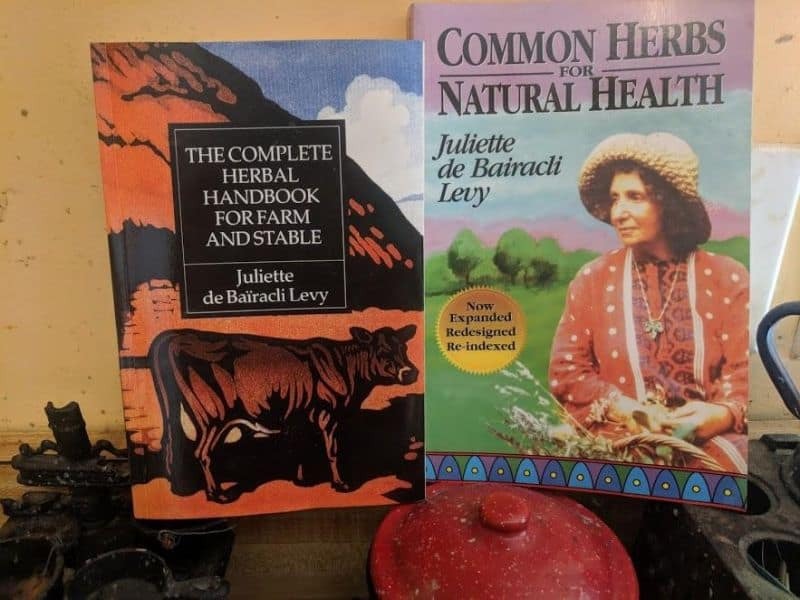 They are easy enough to read and understand by a novice herbalist, yet still backed with enough information that even a seasoned home remedy practitioner will learn something new as he or she turns the pages. This healing herb is also one of the oldest known cultivated grains in history. In addition to its healing power, amaranth is packed with vital nutrients, including vitamin C, vitamin B, and iron. Amaranth is a common ingredient in anti-inflammatory natural painkillers. It is known to help boost bone strength, stimulate the repair of bones and muscles, could lower blood pressure from dangerous and painful levels, and enhance the immune system. This ancient herb possesses the same peptide that is capable of relieving pain from gout, arthritis, and could help prevent damage from free radicals that have been known to cause cancer. Taking care of a diabetic and the pain that comes from fluctuating sugar levels will likely be extremely problematic during a long-term disaster. Amaranth has been known to help regulate blood sugar levels and decrease insulin levels. The herb can help reduce the spiking of blood sugar levels and prevent a potentially deadly diabetic attack. Due to the herb’s high content of vitamin A, it is often consumed to treat eye problems…and to prevent them. Amaranth has been known to not only prevent painful cataracts but also could decrease macular degeneration problems. There are multiple varieties of amaranth, but each type requires a minimum of five hours of sun each day to thrive. The herb grows best when it is placed in a well drained soil. Plants are thin and lightweight but can grow up to 10 feet tall and might need staked if being cultivated in a container. Amaranth seeds can be tossed onto a salad, sauteed, or thrown into soups to garner the herb’s medicinal benefits. You can also mix one teaspoon of leaves with one cup of water and consume the mixture (up to twice a day) as a cold tea. The herb is not known to produce any major side effects, but it is recommended not to eat mature leaves raw because the nitrates in the leaves could pose an adverse effect in some people. Diabetics are strongly cautioned from eating the grain (seeds) of the amaranth plant directly and consume on the leaves to avoid a potentially unwanted fluctuation in blood sugar levels. This natural pain killer salve can soothe arthritis pain, muscle aches, tendon discomfort, general back pain, and ease the throbbing associated with deep bruises. • ¼ of a cup of beeswax pastilles – if you do not have the beeswax you can omit it and use this mixture as a massage oil instead of a salve. • 1 cup of your favorite carrier oil – almond, coconut, or olive oil are recommended. • Optional – 2 drops of eucalyptus essential oil, lavender oil, or 2 teaspoons of arnica flowers. 1. Steep the turmeric, ginger, and cayenne into the carrier oil in the sun for the afternoon or overnight in a sealed Mason jar. I using the optional flowers petas, steep them in the oil as well. 2. Strain the mixture through a cheesecloth, clean piece of fabric, or coffee filter. Squeeze firmly to get out as much of the liquid as possible oil into a roll-on bottle. 3. Combine the herbal mixture and the beeswax in a pot – double boiler is highly recommended. 4. Stir in the optional essential oils. 5. Once the mixture has completely combined, pour it into container with a firm fitting lid and allow it to cool and harden. Massage a small amount onto the sore or injured muscle and joint area. A little bit goes a long way, the salve (or massage oil) heat up was it is rubbed onto the skin. Typically, it takes about a week or so for the warming salve to yield optimal results. The natural warming salve is not recommended to be used over open wounds or on pregnant or nursing women. Some users could experience a skin “burn” or rash if using this strong warming salve on their face. Ginger is often used by natural remedy fans in place of over the counter pain reliever like ibuprofen.It boasts powerful anti-inflammatory and antioxidant components. These helpful compounds can help reduce both acid and fluid that can build up in joints (especially in arthritis patients) and cause painful swelling. This herb is at the foundation of a plethora of natural healing, pain fighting, and anti-inflammatory remedies. Cucumin, which is found only in turmeric, is the active ingredient and causes the bright orange hue of the herb. Turmeric not only helps draw out infection and fight pain, it has been known to improve blood circulation and stop blood clot. The healing benefits of turmeric can be garnered several ways. 1. Make gel caps filled with turmeric and take daily like a vitamin. 2. Toss a pinch of two of turmeric in everything that you cook. 3. Mix 1 cup of water with 2 tablespoons of turmeric and drink to help prevent pain, fight infection, and reduce swelling of muscles and joints. 4. Make turmeric and honey “bombs” to ease pain and as a treatment for just about everything fro the common cold to the flu. The little herb and honey balls typically keep up to 14 days when refrigerated. • 3 tablespoons of a binding agent – honey or coconut oil are recommended. • Optional – 1 teaspoon of quercetin powder – this helps to activate the curcumin and enhance absorption into the body. 2. Heat the binding agent on low heat – stirring constantly to prevent scorching. 3. Once the binding agent has liquified, add in the black pepper, turmeric, and quercetin – if using. Stir to thoroughly combine. 4. Remove the cook pot from the stove and spoon out up to a quarter-sized amount of the herbal remedy onto the wax paper – forming it into a ball shape. Space out the herbal drops so they do not touch. 5. Place the turmeric bombs into the deep freeze on the baking sheet. Do not remove the herbal balls until they are entirely firm throughout. 6. Store the turmeric and honey bombs in an airtight container and keep them in the refrigerator until ready to use. Typically, adults consume about 5 grams of the remedy on a daily basis to ward off pain or treat sickness. This wild plant is commonly referred to as “lettuce opium” by users – even though it does not actually contain any opiates. It is native to Asia and Europe, but can be grown in the United States. The wild lettuce has been used as a sedative in some regions of the globe for centuries. Extensive or chronic consumption of wild lettuce could have a negative impact on the brain. The wild plant is often used as a natural painkiller for headaches, migraines, whooping cough, chest congestion, and menstrual cramps. Wild lettuce is most commonly ingested by steeping the leaves of the plant into a tea. To make the tea, steep two teaspoons of dried leave into one cup of boiling water for about 15 minutes. The tea is not recommended to be consumed more than three times per day. This herb has long been used as a natural painkiller to treat stomach pain, toothaches, headaches, and more. 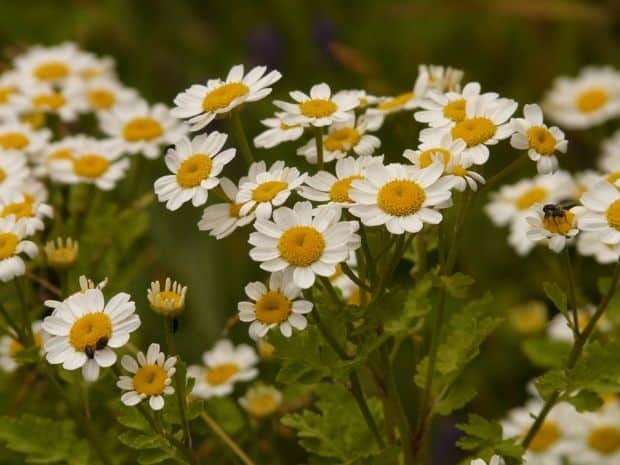 Feverfew has also been used to some degrees of success to treat arthritis pain. This essential oil can be rubbed onto sore muscle and tendons to massage away tension and to help reduce inflammation. Peppermint oil also boasts this same ability and when combined with lavender oil, the mixture has been known to also combat even severe headache pain. To reduce headache or neck pain, dab a few drops of peppermint oil onto you finger and massage your temples and neck gently in circles. This natural remedy grows on vines in South America. It is highly distinguishable by its cat’s claw or hook and horn style shape. Typically, cat’s claw is consumed as a pill or capsule. This natural painkiller garners its inflammation and discomfort relief properties from its prostaglandin hormone properties, much like ginger. In addition to being a painkiller, cat’s claw is also known of its infection fighting and immune system boosting prowess. It is most often taken to relieve pen that stems from chronic fatigue, arthritis, hemorrhoids, asthma, allergies, diabetes, ulcers, and even cancer. Arnica essential oil is perhaps one of the most popular and yet sometimes hard to find natural painkillers. It is especially useful in relieving pain associated with muscle aches, arthritis, and carpal tunnel. The oil is rich in vitamin K and can be massage onto the body to reduce inflammation in addition to decreasing throbbing or stabbing pain. Although arica oil is native to Europe and prevalent in Siberia, it can also be cultivated in many areas in the United States, particularly in mountain regions. Typically, arnica grows up to 24 inches tall and produces bright orange and yellow blossoms. Arnica oil is also commonly referred to as Leopard’s Bane, Mountain Tobacco, and Wolf’s Bane. Arnica oil comes from a flowering dairy plant that grows primarily in Siberia and Europe, but is also found in many regions throughout North America – particularly in mountainous regions. That daisy grows up to 2 feet tall and up to three bright yellow flowers with an orange enter blossom on the plant. This South African herb is most prominently used to treat stomach aches, arthritis, ulcer pain, intestinal problems, as well as and lower back pain. It is recommended that pregnant and nursing women not consumer this herb or even use it topically. Devil’s Claw oil may also naturally relieve pain associated with fibromyalgia, migraines, and myofascial conditions. Cloves can do a whole lot more than relieve tooth and gum pain – their most common natural painkiller use. Cloves are rich in potassium, iron, iber, omega 3 fatty acid, phosphorus, calcium, iodine, magnesium, as well as vitamins C and K. They boast anti-inflammatory, anti-fungal, and anti-viral properties. To relieve stomach pain naturally (even morning sickness) simply pour a few drops of clove essential oil onto a clean cloth and sniff – or chew on cloves for a few moments and then spit them out. Powdered cloves can be mix at a one to one ratio with honey and consumed to each nausea pain. When clove essential oil is mixed with a pinch or two of honey and then stirred into a warm glass of water, it can also be consumed to treat stomach pain and to stop vomiting from occurring. Cloves also boast a little known but pain-repelling quality – the repelling of mosquitoes. Crush up a few cloves and rub them onto your skin, or dab clove essential oil onto the skin, clothing, and hair, to deter mosquitoes for at least 12 hours. 1. Place the cloves in a Mason jar. 2. Pour in just enough of the chosen carrier oil to fill the jar to 1 inch above the cloves. 3. Put a lid and ring on the Mason jar and secure them tightly. 4. Shake the jar vigorously multiple times. 5. Place the jar in a cool dry place for 2 weeks – shaking about three times each day. 6. Strain the cloves through cheesecloth, a coffee filter, or a clean piece of cotton cloth to extract the oil. Do not pitch the cloves, they can be used at least two more times before losing their medicinal potency. Learn how to take care of medical emergencies, treat common illnesses and injuries, and create natural preventative medicines. Educate yourself by all affordable and feasible means, such as: taking a class, participating in an online workshop, watching videos created to show how to make or treat specific medical events, and by buying books and downloading printable guides that offer step-by-step home remedy and first aid instruction. 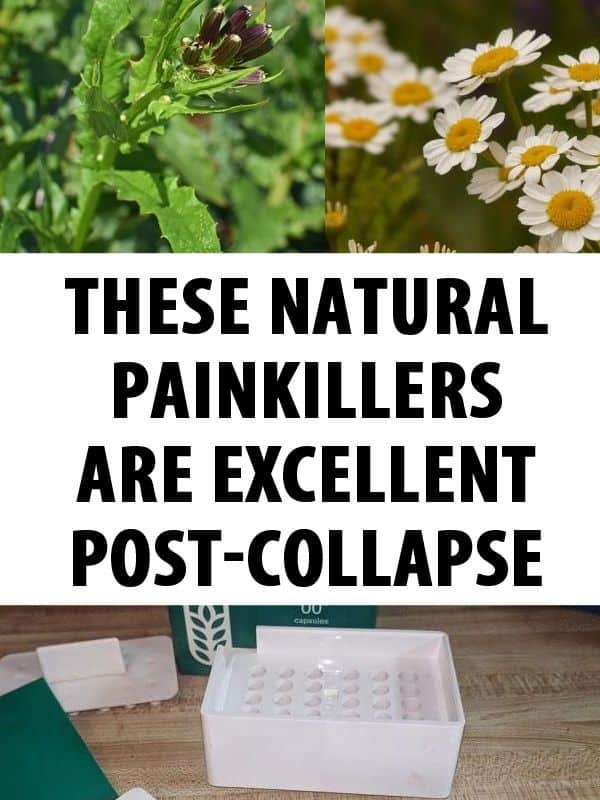 What are you favorite natural painkillers? Please share your tips with the Survival Sullivan community by posting in the comments section below. I am currently using Wild Lettuce Oil as a sublingual, but I bought it online. For years I have destroyed that plant thinking it was just a nuisance in the garden then read about it. I use it to help with the pain in my back until the injections work. It doesn’t get rid of all the pain but it helps. Now I find you mentioned something new to me, Arnica Oil, which I ordered some tonight for the same back thing. Devil’s Claw and Cat’s Claw I cannot use because of blood thinners. That said you missed 2, Cannabis Oil, which helps some and the actual MJ plant. I vaped MJ during chemo and it was a game changer for me, so much so my opposition to it has changed. At the time even my Oncologist at UT Medical Hospital gave me Marinol, Pot in pill form.